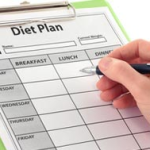 Having an eating plan can have a big impact on your weight and your health – plus it can save you time and money. With a plan you know what your meals will look like and what you need to buy. That makes shopping more efficient and cuts down on unplanned trips to buy one or two items. And with a shopping list in hand – a byproduct of good planning – it’s easier to resist impulse purchases, especially the ones that can steer you off track. This doesn’t have to be complicated. To get started, jot down some of your favourite meals. Cooking for a family? Ask them to suggest ideas, too. For more inspiration, flip through cookbooks or check out recipe websites. If you need any advice on what is good and what you need to avoid get in touch and we will give you some help. Plan several days or a week of meals at a time. Make sure to include side dishes as well as starters and some healthy afters, too. When you have your plan of meals and snacks, create a shopping list of the ingredients you’ll need and then take a moment to feel good knowing that having a plan will make it easier for you to stay healthy.